Another exclusive addition to the Galaxy S phone series by Samsung, the Samsung Galaxy S Blaze 4G is a latest phone that comes with 1.5GHz dual-core Qualcomm Snapdragon S3 processor, a 1.3-megapixel front-facing camera, and Android 2.3.6 Gingerbread OS. The phone has 4-inch Super AMOLED screen. The Blaze 4G has a black body with rounded corners. On the top side, Blaze 4G is much thicker than the other phones sets of the series. The back of the phone is given and provided with a soft-touch finish. The phone measures 4.9 inches tall by 2.5 inches wide and 0.44 inch deep. It weighs 4.5 ounces. The screen has WVGA 480x800-pixel resolution and is colorful. Blaze 4G has Samsung Touch Wiz interface to ride on top of Android 2.3.6 Gingerbread. Swype controls the virtual keyboard on the device. On the top of the screen is located 1.3-megapixel front-facing camera, and below there are four touch-sensitive navigation buttons for the basic commands. At the back of the phone is located 5-megapixel camera and LED flash. At the left side of the phone is located the 3.5mm headset jack and the Micro-USB port on the bottom. The phone's right spine has the power button and a miscroSD card slot equipped with 4GB of storage which is very exciting and exclusive to use and employ. For more space and storage it can be upgraded to 32GB card. 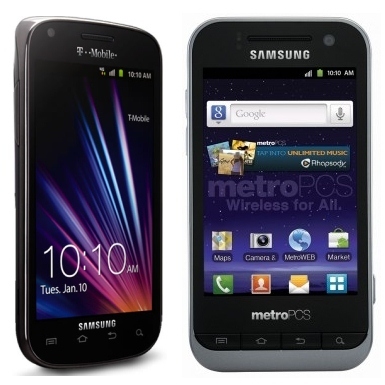 Similar to other Android phones, it is provided with Wi-Fi, GPS, and Bluetooth (3.0).